Multi Tile: (available in 12"x12"x3/8" and 12"x24"x1/2") Grey-green with yellow ochre, blue, charcoal and rusty red. Natural finish. 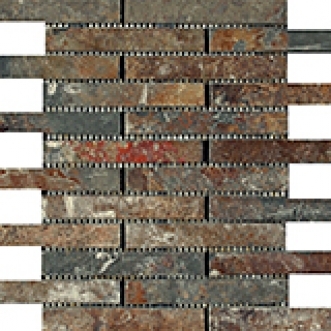 Brick Patterned Mosaic: (available in 1"x6") Grey-green with yellow ochre, blue, charcoal and rusty red. Natural finish. Tumbled Opus Romano Pattern: (irregular) Mesh Mounted. Grey-green with yellow ochre, blue, charcoal and rusty red. For Multi Tile, colour and shading differ from one tile to another, as created by nature. Some Slate colours are more variegated than others, so we recommend viewing a number of full size tiles to appreciate the range and pattern of the colour variegation. Our Slates are stocked in various finishes and sizes. Slate tiles are very durable and generally suitable for many residential and commercial uses, functional as well as decorative. We recommend that this natural stone be sealed before grouting.Please enquire about sizes and finishes available by special order.